Interconnective Security Products have announced that they have added LED Lenser®, the world’s leading brand of technologically advanced, high quality LED torches and headlamps, to their product range. The LED Lenser® range of torches are a result of unrivalled engineering and they use a variety of patent pending reflector systems to create the brightest, most energy-efficient LED lights available. Ryan Gordon, a product manager at Interconnective Security Products, said: “We are excited about adding the LED Lenser® range of torches which both enhance, and expand, the protection of our offering to frontline security personnel. Interconnective provides cutting-edge technology to frontline security personnel. The new LED Lenser® range reinforces our mission, which is to supply the most innovative and professional tools to create a safer and more effective environment for every frontline security officer”. 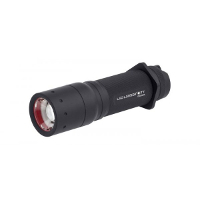 LED Lenser® offer a variety of different torches and headlamps which are all robust and suitable for use by frontline security personnel. The LED Lenser® range of torches are also water and dust resistant for use in adverse conditions.